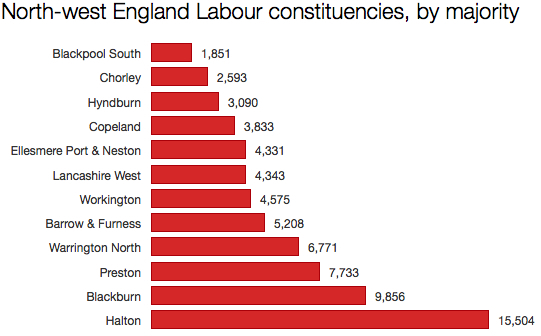 The counties of Cheshire, Cumbria and Lancashire hold the greatest concentration of Labour targets in the country. Outside of Merseyside and Greater Manchester, north-west England offers the best chance for Labour to make a real advance – or to fall desperately short. It is here that Ed Miliband will be hoping to chalk up enough gains to offset potential losses to the SNP in Scotland, and any other missed targets in southern England. Expect to see him and a host of senior Labour figures making repeated visits to the region between now and polling day. Labour suffered across this region at the 2010 general election, but its poor performance created a host of Tory marginal seats, including no fewer than four with majorities below 1,000. These three counties contain the highest number of marginals in the country outside of south-west England, with over half the constituencies boasting majorities of under 5,000. My instinct is that some of these marginals will elude Labour’s grasp – the likes of Pendle and Rossendale & Darwen – while others will tumble fairly easily. But if Miliband can’t win in places such as Carlisle and Warrington South, he will almost certainly not be prime minister. As you can see, Labour doesn’t have quite as many marginal seats as the Conservative, and it has no ultra-marginals here at all. I expect there to be net swings to Labour in all these seats. 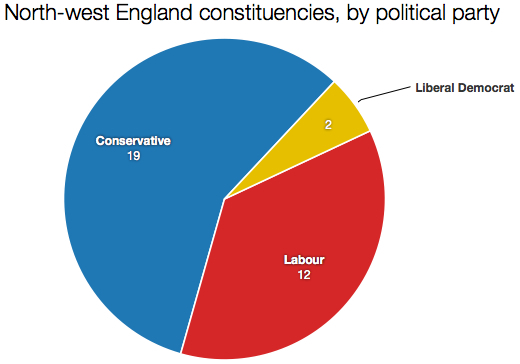 Pragmatists in the Tory party ought to argue there are more winnable battles to be fought elsewhere in the country, specifically against the Liberal Democrats in the south-west. In short, the Tories are probably best served focusing on defending marginals in this region rather than seeking an advance. After the 2010 election there were two Lib Dem seats in this area of the country. After the 2015 election there will be one. Labour will take Burnley, and possibly with ease. 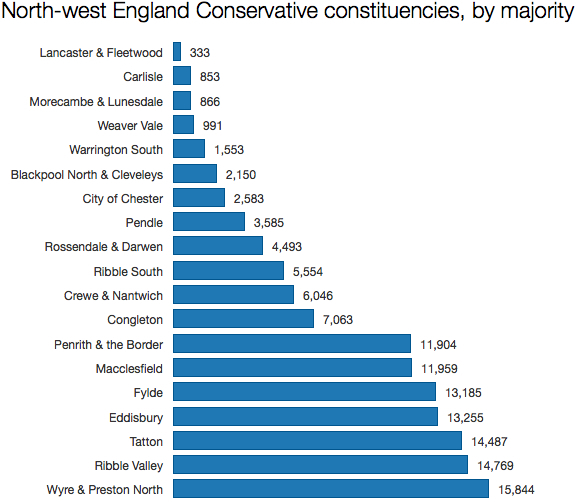 By contrast, Tim Farron’s seat of Westmorland & Lonsdale is one of the safest Lib Dem constituencies in the country. He won’t be going anywhere – other than into a leadership contest to replace Nick Clegg.